Here’s a long interview from Polygon’s dorm lounge with Sledgehammer Games’ co-founders Michael Condrey and Glen Schofield about Call of Duty: Advanced Warfare, with some details about the game you might not have heard. The main thing that perks up our ears here is a promise of “radically innovative” multiplayer. A shakeup to the Call of Duty formula? It will be interesting to see how that plays out. One could expect that the multiplayer would be different anyway because of the new opportunities offered by the ex0-suits. “Everything you’ve seen in Seoul kinda gives you an idea of where we’re going. And all of those abilities,” Condrey said. He also said there would include “a broad new set of rewards” and you have the ability to play your type of soldier, including choosing a man or woman. • Schofield says the protagonist Jack Mitchell’s story will take place over 10 years, which is another shakeup for Call of Duty, where we often see multiple protagonists over one conflict. 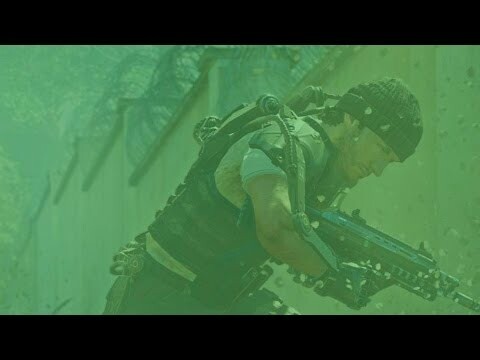 • The pair have often said that narrative is one of their most important focuses in the game, but they reveal here that Sledgehammer has spent two and a half years working on the script for Advanced Warfare. • They say that in terms of developing the villain for the game, they were thinking about Kevin Spacey for their bad guy and Atlas Private Military Contractor CEO Jonathan Irons. Activision gave the go-ahead to pursue the actor and “we got him,” Schofield says. • Having a third year to work on a Call of Duty gave Sledgehammer a chance to “take some risks.” They prototyped the exo-suit and boost jump within the first six weeks of development and have been “refining it for nearly three years,” Condrey said. • Schofield said a lot of thought went into production design and what the world might look like in the future and how little details like forks might change. The team even researched the tar on the road, and how it might look different because it is made of different compounds in the future.